Visiting to the Himalayas is a once in a lifetime experience. Stretching over 2,400 kilometers through five different countries, the Himalayas not only define the people living amongst the jagged peaks, they have a way of reshaping visitors who are willing to leave most modern comforts behind. The best way to earn those benefits is to walk the trail Sir Edmund Hillary walked, to listen to the wind on a ridge 18,000’ above sea level, to eat what the locals eat and find for yourself the benefits of the Himalayas which will draw you back, time and again. Many tourists flock to Nepal for the incredible and varied trekking and traditional culture opportunities in the Himalayas. The amazing scenery, friendly people and cheap prices make this part of the world extremely popular for active and adventurous travelers. While there are companies that will organize all aspects of your trip, for a price, there are budget friendly ways to trek in Nepal. Here are some suggestions on ways to save money and support locals directly when visiting this stunningly beautiful part of the world. In the Everest Region of the Himalayas, there are no roads. At a certain elevation the bus line ends and it’s time to start walking. Otherwise, take a flight into Lukla to knock off a couple of trail days. After that, cars, buses, trucks and their pollution are long gone. While yak-dung fires are common to heat most homes and tea houses and homes use firewood/kerosene as a cooking staple, the opportunities to inhale pristine alpine air are as vast as the landscape. All this attention to the minutia allows for one of the greatest freedoms: time. With those details taken care of, you have time to relax and reflect. Life becomes simple; walk two hours, stop for lunch, walk two hours, arrive at the next town and change into warm clothes, relax until dinner, sleep. Wake up and do it all again after someone prepares your breakfast. No winding streets to navigate, no worries about crossing borders and not often will you need to be concerned about money. What is a Porter and do I need one? 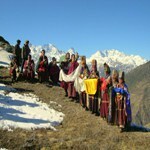 Porters are locals who can be hired to carry extra or larger bags during a trek. Many do not speak any English. It is possible to find someone to serve as both guide and porter if you require both but can’t afford to pay two people. In general, guides will cost more than porters and their price depends not only on their experience but also the location and length of the trek. Ask as many people as possible, including other trekkers, to get an idea of the going rate for your trek of choice. It is important to remember that when hiring independently ensure your guide is qualified and that they are properly equipped to make the trek safely. Although some of the more popular trails like Everest Base Camp, Annapurna Base Camp, Kanchanjunga are well marked and guides are not necessary, hiring a guide and/or porter is a great way to get the most out of your trek. Not only are you supporting the local community but the knowledge and experience a good, qualified mission hearted guide can provide on the history, culture, region and Nepali people adds to the richness of the trip. Lastly, there is the additional benefit of having a local to help translate when communicating with locals. The most popular, comfortable and convenient way to visit is to stay in tea houses or homestay along the way. These tea houses provide both food and accommodation and are found at, and in between, villages along the trails. Prices are cheaper in the early stages of a trek and get increasingly more expensive the further from civilization you get since supplies and equipment need to be carried in also accommodation prices can often be negotiated if you agree to eat meals at the tea house. Be sure to ask to see a room prior to agreeing or paying, as some places are better than others. Camping is also an option but due to the convenience and affordability of tea houses this is a much less common way to trek. Do I need to bring trekking gear? It is not necessary to bring all the gear you will need with you to Nepal. There are numerous shops in Kathmandu and Pokhara selling everything from clothes and jackets to sleeping bags and backpacks, although the cheap prices are usually due to the fact that the brands are knock-offs. Regardless, the gear is usually good enough for treks of two to four weeks in length. One item you should bring yourself is a sturdy pair of worn in hiking boots. There are also places to rent equipment which is another budget friendly option. Visiting in Nepal is one of the most rewarding and unforgettable experiences a traveler can have during your visit if there appear any help in need or vision to do something in Nepal please contact us.